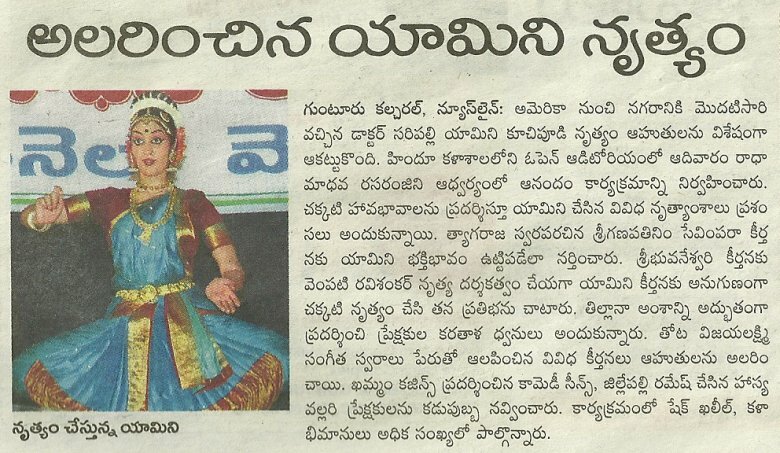 "Ultimately it is peace within that we seek (within ourselves), and that is what we get from our classical Indian dance forms"
S.Yamini, a disciple of Vempati Ravi Sankar, danced ‘Manduka Sabdam’ well depicting the episode of Gajendramoksham from Bhagavatam. However it was her presentation of ‘Etuvantivade’ a padam of Kshetrayya stood out. That she has a good sense of laya was evident all through. 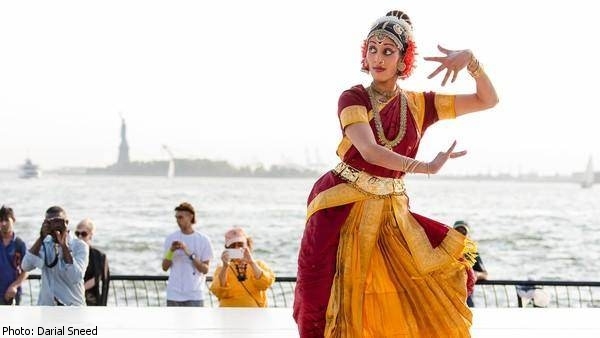 Yamini Saripalli, who is also from Washington , a mature dancer who did complete justice to the Vempatti school in her performance. 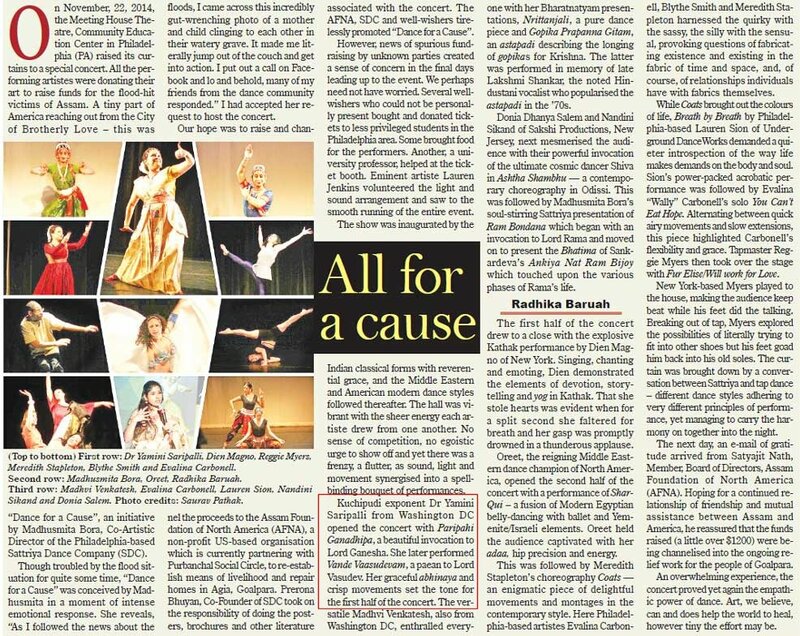 Credit goes both to the Guru who has maintained a high standard of technique and a carefully chosen repertoire, and to the hard work of these dancers. They are united in keeping the reputation of Kuchipudi dance in tact. In a particularly lovely rendition of the invocation to the elephant god Ganesh, Kuchipudi practitioner Yamini Saripalli suggested the trunk's swing by loosley lifting her leg, and its finger-like grasp by keeping one hand closed like a bud. She conveyed the elephant's girth and gentleness with swaying, sideways steps, and his massive feet with heel-toe stamps. And yet she would periodically interrupt the rhythmic dancing to press her palms together in prayer to the figure she had just embodies, then stretch her arms towards us as if to say, "look what bounty he has given me: you". We were her pious rewards - devotees of Ganesh by way of her art. Her perfect footwork, body movement, and stage presence were a feast to all, from dance enthusiasts to novices. She performed with visible passion, ease of movement, and grace. "Yamini Saripalli's Thillana, composed by Guru Vempati Chinna Satyam, was enthralling"
"express(es) herself in dance through a deep, involved technique and clarity in interpretation...strike(s) the perfect balance between her profession and her passion with perfect ease and grace"
"excellent body movements and stage presence"